Homoeopathy — Not Just a “Placebo Effect”. My daughter brought a cute little bundle of joy ‘Jo’, a Cocker Spaniel pup to our house a month back. She needed to be fostered till a home could be found for this little baby, who was just about 35 days old. She was teething and since she was biting into everything with her needle sharp teeth, she came with a moderate stomach infection. She was passing smelly-yellowish-greenish-watery stools or at times even plain water on least eating or drinking. This got me worried. 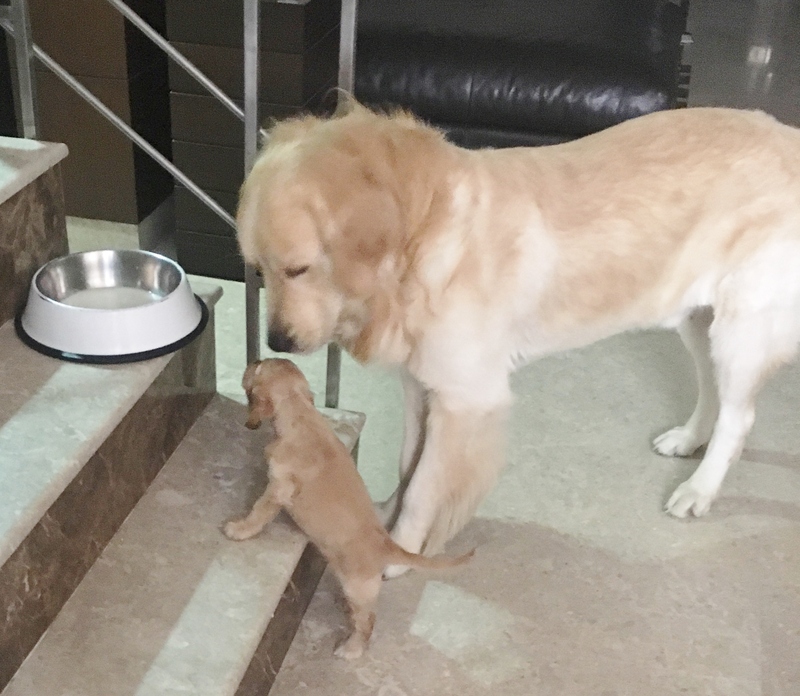 When I spoke to my vet who takes care of my near four golden retriever ‘Junior’, he wanted me to wait n’ watch but suggested me to be careful because she is too young and this could get dangerous. In a state of panic, instead of just waiting n’ watching, I decided to try out Homoeopathic medicine for her. I deal with a lot of infants and almost all of their day to day ailments starting from the very common – neonatal jaundice, to colds-coughs and fever, stomach infections, teething troubles, skin disorders, chest infections and wheezing etc., are wonderfully taken care of with homoeopathy. Added advantage – they get less cranky, eat good even while on medication and recover faster. There are no side effects, no issues of vomiting immediately after taking in the medicine and homoeopathy gives the gentlest retrieval to health. In such cases, due to lack of presenting symptoms from the sufferer which are often so very important for homoeopathic prescribing, the prescription depends upon the attendants’ narration and doctors own judgement of the case. Here I trusted my judgement in prescribing – being in a dual position of her foster parent and her doctor. Jo responded almost instantly after about 2-3 one hourly doses. She passed less stools, her stomach was less bloated, she became more active and slept peacefully without growling during her naps. Time n’ again whenever I hear or read about someone commenting on Homoeopathic system being nothing more than a ‘placebo effect’, without having even an iota of knowledge about the subject, I wonder how come in my clinical practice, my patients especially infants, small children, children with special needs and even pets are responding so well to this so called ‘Placebo effect’ which I offer as treatment!! Researchers use placebos during studies to help them understand what effect a new drug or some other treatment might have on a particular condition. For instance, some people in a study might be given a new drug to lower cholesterol. Others would get a placebo. None of the people in the study will know if they got the real treatment or the placebo. After the trial, the effects of the drug and the placebo on the people are then compared to determine the effectiveness of the new drug and check for any side effects. In homoeopathic trials, a double-blind method is used while proving drugs on healthy humans (the guinea pigs), which means – in addition to the prover, even the researcher who’s administering the drug/unproven medicines doesn’t have a clue about the drug. This is done, in fact, to prevent the placebo effect or observer bias. As suggested in the video, lot of care is taken in preparing homoeopathic medicines by a special method of dilution called Potentization. The substance used to prepare the medicine is either diluted in water or inert alcohol. This dilution is carried out in a progressive way, up to the level where only a minor trace of the original substance remains in the actual medicine given to patients. This method of dilution is so refined that one hardly finds any ‘measurable trace’ (physiological quantity) of medicinal substance in it. This many a times forces critics, who haven’t really studied the biochemistry of homoeopathic medicines, to question or label it’s success as a ‘placebo effect’. Most of the discoveries of today were a subject of ridicule yesterday! Recent advances in nanotechnology and experiments carried out by IIT Mumbai, a renowned institution of engineering and research in India, has demonstrated the presence of the original substance in minimum quantities in homoeopathic dilution. It also goes in compliance with the law “Matter can never be created nor destroyed”. By the process of Potentization, the inherent (latent) medicinal powers of the drugs are raised to a dynamic level to bring about a cure in patients. In terms of material quantities, since the drug substance in the medicines is very minute, hence homoeopathic medicines produce NO-SIDE-EFFECTS. Homoeopaths all over the world get a variety of cases in their kitty – starting from infants, children with special needs, convulsions, even de-worming medicines, migraines, arthritis, stones in kidneys n gallbladder, uterine, ovarian or prostate growths, fibroadenosis breast, skin conditions like psoriasis, lichen planus, leucoderma, eczemas, urticaria etc., organ dysfunctions, old age illnesses of alzheimer, dementia, de-addiction cases, cancerous conditions in initial stages… the list goes endless. Believe me, the patients they get are NOT plain “psychologically weak” cases with only functional disorders, who would need just a ‘placebo effect’ to be up and about. In fact the patients today are very intelligent and well informed. They would not waste their time and money on something that can’t relieve their illness in the real sense. Illnesses – mild, moderate or severe – most of them do have an answer, if not a complete cure in the science called HOMOEOPATHY. Note :: No system of medicine is complete. Homoeopathy comes with its limitations too. An ideal physician is one who knows when and where to accept it. Posted on October 1, 2017 October 13, 2017 by Dr. Renu MadanTagged Animal homeopathy, homoeopathic treatment, Homoeopathy -- Not Just a "Placebo Effect", Homoeopathy for pets, placebo, Placebo Effect. Next Next post: Varicose Veins: Be Aware… Stay Healthy!